Window tinting is not just for cars and offices any more. Residential tinting or home tinting as it is also referred to, has many benefits. It can help modernise your home, cut out glare, reduce cooling and heating costs, reduce UV and provide added security to your home. At Home Tint, we have a quality range of solar window tinting products available. These include ceramic films, dual reflective neutral films, dual reflective silver films (ceramic and sputtered) and silver reflective. We also stock coloured tints, clear tints and frosting for your home. Reduces Heat: Keeps your home, office and car cool in summer and warm in winter. Window tinting help to insulate windows. Saves Money: Savings on electricity bills can be significant with the correct window tint. Reducing heat transfer via the windows makes your house cooler inside and your aircon does not have to work so hard. Provides Privacy And Security: Living on a smaller block? Neighbours too close for comfort, window tinting provides privacy from prying eyes. 99% UV Protection: Protects furniture and flooring from fading. Reduces Glare: Having trouble seeing your computer or TV Screen – window tinting reduces glare dramatically. Adds Value: Looks great and adds value to your home. Frosting – Offers an affordable and easy solution to privacy. It is a semi-transparent film available in a range of colours and patterns to suit your home. Frosting works well on large bathroom windows and front doors. Safety Film – Window glass can become extremely dangerous, even deadly, when shattered or broken panes transform into flying “shards” of glass. 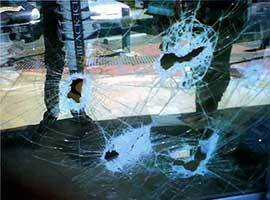 Natural hazards, accidents and crime all pose potential risks to most glass systems existing today. Protect yourself from flying glass with the added benefit of 99%UV Protection, with our safety films. Also suitable for home day-care-centres. 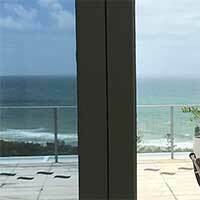 Safety films are available in clear and tinted finishes to suit your home. Security Film – Furthermore, preventative films can greatly reduce the risk of human injury and property damage. The durable polymer film construction and tough adhesive bonds to glass, creating a functional “safety net” that holds glass in place after impact. This protects your home, property and family from unwanted intruders. 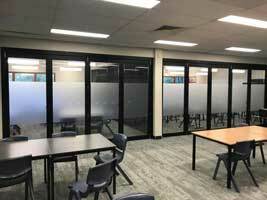 Security films are available in clear and tinted finishes.